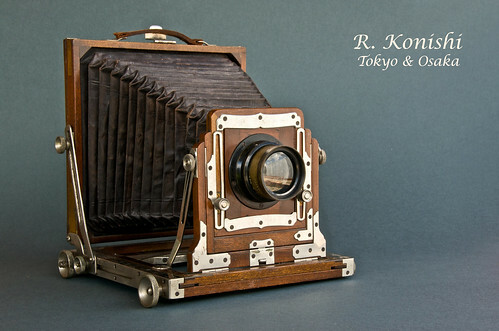 Konica was the oldest Japanese photographic company until it stopped camera manufacturing in 2006. 2.3.1 SLR, Konica Bayonet Mount "I"
3.1.1 Konica Bayonet Mount "I"
The company originated as a drugstore called Konishi-ya Rokubei Ten (小西屋六兵衞店), operated by Sugiura Rokuemon V (5代杉浦六衞門). His son Sugiura Rokusaburō (杉浦六三郎) entered the company and expanded its activities by selling photographic products beginning in 1873. Sugiura Rokusaburō took the name of Sugiura Rokuemon VI (6代杉浦六衞門) in 1879, and the company was subsequently renamed Honten Konishi Rokuemon (本店小西六右衞門), abridged as Konishi Honten (小西本店). Early cameras were produced by artisan subcontractors, such as Hasegawa Toshinosuke (長谷川利之助) and Tōjō Kamejirō (東条亀次郎). The company founded a manufacturing branch called Rokuoh-sha (六桜社) in 1902, and released the Cherry in 1903, the first Japanese camera to have a brand name. The factory of Hasegawa Toshinosuke became the wood workshop of Rokuoh-sha in 1906. Most of the camera production was still assumed by other subcontractors, many of which were merged into Rokuoh-sha in 1919. The company became G.K. Konishiroku Honten (合資会社小西六本店) in 1921. The character roku (六) is a double allusion to Sugiura Rokuemon VI: it means "six" and is the first character of Rokuemon. The logo of the company shows this character inside a cherry blossom. Konishiroku founded the Konishi College of Photography (小西写真専門学校) in Tokyo in 1923. It introduced the Pearlette in 1925, which would be the first mass-produced Japanese camera, under the supervision of Yamada Kōgorō (山田幸五郎). 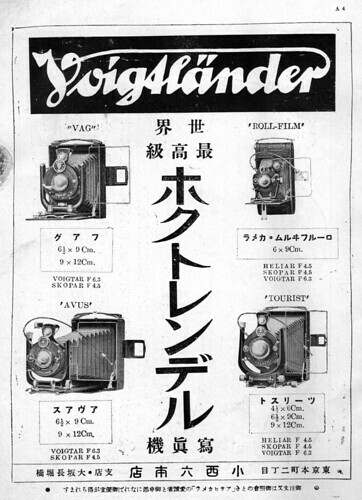 In 1929, it launched the Sakura rollfilm, the second rollfilm brand in Japan. In 1931, it released the first Japanese camera lens commercially available, called Hexar; this name was again formed after the number "six". The company changed status again in 1936 and became K.K. Konishiroku (㈱小西六). The cameras and lenses were still marked as made by the manufacturing branch Rokuoh-sha. In April 1943, the retail and wholesale activities were stopped and the company was reorganized as Konishiroku Shashin Kōgyō K.K. (小西六写真工業㈱), based in Yodobashi, Tokyo; the name Rokuoh-sha was abandoned around that time. The company name was translated after the war as Konishiroku Photo Industry Co., Ltd. 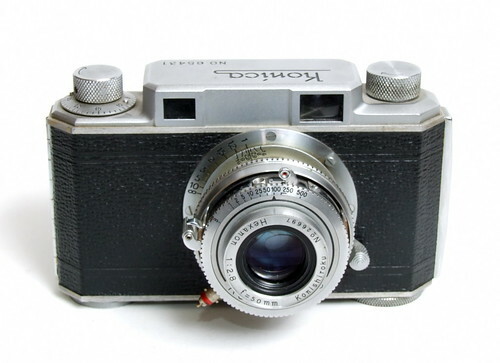 The name Konica was originally that of a 35mm rangefinder model presented in 1947. Similarly to "Leica", "Yashica" and many others, the name "Konica" was constructed by abbreviating the name of the manufacturer and attaching "ca" (for "camera") as a suffix. In August 1960, Konishiroku bought all the shares of Taisei Kōki, a minor camera maker in Itabashi, Tokyo. This moved to Tsuru, in the prefecture of Yamanashi, in 1968, and became K.K. Yamanashi Konica (㈱山梨コニカ) in 1972, then K.K. Konica Denshi (㈱コニカ電子, Konica Electronics) in 1983, and is today Konica Minolta Electronics Co., Ltd. The company as a whole changed its name to Konica Corporation only in 1987, although its US branch did so earlier (in 1984). Konica merged with Minolta in 2003 and became Konica Minolta, which would stop the production of cameras in 2006. SLR, Konica Bayonet Mount "I"
The mount is also called Konica "F-mount" or Konica "Early Mount". The mount is also called "AR-mount" or "K/AR Mount". Konica Autoreflex T"2" and Autoreflex FTA"2"
Konica Auto S2, Auto S2 "New", and Auto S2 "EL"
Konica MT-7, MT-9 and MT-11 "Multi"
Konica commenced manufacturing single-use cameras in 1987. As a major film manufacturer, Konica, like Agfa and Kodak, had to include disposable cameras in its range after Fuji had pioneered the concept in 1986. Over time, Konica developed a number of specialised disposables not offered by other manufacturers, notably the Waiwai / Superwide with 17mm lens and mirror on the front. Konica BM-S 100 "Super Big Mini"
The Midg is presented by some sources as a Konishi product, copy of the Butcher model of the same name; however this is unsure and it might be a camera imported by Konishi instead. Konishiroku made a prototype interchangeable lens 35mm film rangefinder camera in the early 1960s — the Konica FR that utilized the Leica screw mount. However, that camera was never put into production. It wasn't until many years later with the Konica Hexar RF that they produced their own interchangeable lens rangefinder camera, this time using Leica M-Bayonet mount. The Hexar RF variants remain the only interchangeable lens rangefinder camera Konica/Konishiroku ever put into full production. However, Konishiroku earlier produced a small range of standard lenses in Leica screw mount in the mid-1950s. Some manufacturers of Leica copies offered these lenses as original equipment fitted to their cameras, and others offered them optionally. In the 1990s, the Konica company also made a few lenses in Leica screw mount before the introduction of the Hexar RF. 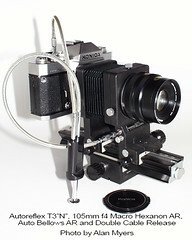 Lenses for Hexar RF cameras: These lenses are also usable on any Leica M-bayonet compatible camera. See Konica SF. This prototype 4.5x6 format camera and its lenses were never put into production. 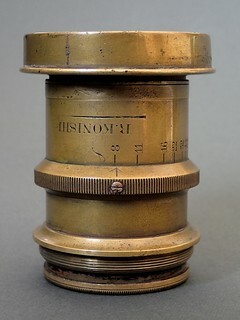 Other lenses were planned but never made: 35/4, 180/4.5, 250/5.6 and 500/8. Note 1: Konica 35mm SLRs were designed with a shorter than usual lens to film register, which means the distance from the lens mount to the film plane is less than most other SLR cameras. This allowed a great many other manufacturers' lenses to be easily adapted without the need for additional optical elements. The shallow register allows room for an adapter to be fitted. It is believed that this design feature was deliberate. Unfortunately, it also means that Konica lenses are not easily adapted to other cameras. Their design generally means that to fit other manufacturers' cameras with full functionality any adapter would require additional, corrective optics. Few such adapters are known to have been made. Lower quality optics in any adapter will compromise image quality, while higher quality optics generally make an adapter costly. Alternatively, a Konica lens fitted to another manufacturer's camera using an adapter that lacks any additional optics will generally lose the ability to focus to infinity (but gain close focusing ability). This is much the same as adding a macro extension tube behind a lens because the adapter moves the lens further from the film plane. There is rumor of a Konica lens (K/AR) to Nikon F adapter, perhaps made by a third party manufacturer. This would include a corrective optical element. Any additional information would be appreciated. Note 2: The Nikon F mount lens to Konica Bayonet Mount II (K/AR) adapter was and is the most sought after and priciest of the Konishiroku-made adapters. This was and perhaps still is because when Nikon introduced their PC (Perspective Control) Nikkor lenses it was found that none of the Nikon cameras could meter accurately through the lens (TTL) while the lens was shifted. It was necessary to re-center the lens, meter, then reset the shift. Someone discovered that - via the Nikon-Konica adapter - Konica camera bodies metered accurately with the lens shifted. News spread quickly and many Nikon users in the 1970s who wanted to use the PC lenses also kept a Konica T"2" or T3 camera body on hand for just this reason. Even thirty plus years later this particular adapter often still sells for 5 or 10 times what the others do. Aerial Cameras, various models, incl. For a listing of photographic film, paper and chemical products see Konica film. The company was an important producer of film and photographic chemistry from the beginning of the XXth century. Konishiroku imported various foreign products, at least until World War II. ↑ Kamei, p.6 of Kurashikku Kamera Senka no.10, Shibano, p.90 of the same, and a page formerly published at the R. Konishi Rokuoh-sha website. ↑ Kamei, p.6 of Kurashikku Kamera Senka no.10; Shibano, p.90 of the same. ↑ Sakai, p.10 of Kurashikku Kamera Senka no.10. ↑ Kamei, p.6 of Kurashikku Kamera Senka no.10, and a page formerly published at the R. Konishi Rokuoh-sha website. ↑ Sakai, p.10 of Kurashikku Kamera Senka no.10. More details are found in this page of the R. Konishi Rokuoh-sha website. ↑ Kamei, p.6 of Kurashikku Kamera Senka no.10. ↑ Pearlette supervised by Yamada Kōgorō: Kamei, p.6 of Kurashikku Kamera Senka no.10. ↑ Kamei, p.7 of Kurashikku Kamera Senka no.10. ↑ Shibano, p.90 of Kurashikku Kamera Senka no.10. ↑ Its address in 1943 was Tōkyō-to Yodobashi-ku Jū-ni-sha 320 (東京都淀橋区十二社320). Source: "Kokusan shashinki no genjōchōsa" ("Inquiry into Japanese cameras"), listing the Japanese camera production as of April 1943. ↑ The structure of the name "Konishiroku" (小西六) is ko (小) - nishi (西) - roku (六): nishi within it (meaning "west") is indivisible. (Ni is no more meaningful an abbreviation of nishi than "we" is of "west".) Thus the new name does not "make sense". ↑ 13.0 13.1 Company profile of Konica Minolta Electronics. ↑ 29.00 29.01 29.02 29.03 29.04 29.05 29.06 29.07 29.08 29.09 29.10 29.11 29.12 Formerly published on a history page of the Rokuoh-Sha website. ↑ See this page of the Tōkachi Banbetsu blog. Asahi Camera. 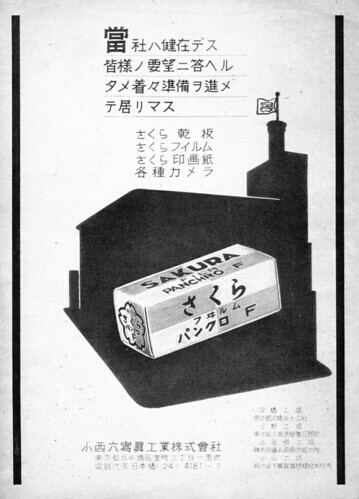 Advertisement by Konishiroku Honten in February 1930, p.A4. Camera Club. 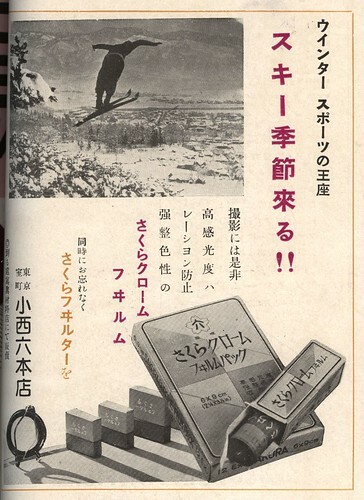 Advertisement by Konishiroku in December 1937, between pp.24 and 25. Shashin Salon. 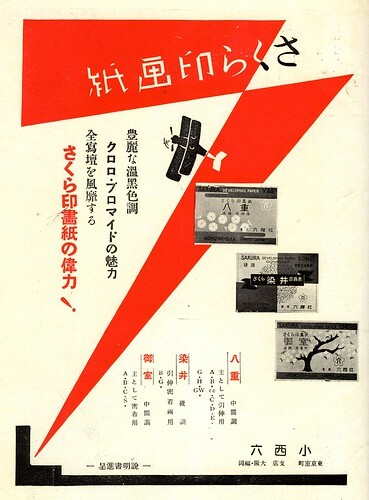 Advertisement by Konishiroku Honten in January 1934, no page number. Kamei Takeshi (亀井武). "Konishiroku ryakushi" (小西六略史, Abridged history of Konishiroku). Kamera Rebyū: Kurashikku Kamera Senka (カメラレビュー クラシックカメラ専科) / Camera Review: All about Historical Cameras no.10, September 1987. No ISBN number. Konishiroku kamera no rekishi (小西六カメラの歴史, special issue on Konishiroku). Pp.6–7. Sakai Shūichi (酒井修一). "'Anbako' kara 'ōtofōkasu' he: kamera no hensen to tomo ni ayunda 114-nen" (「暗函」から「オートフォーカス」へ・カメラの変遷と共に歩んだ114年, From 'camera obscura' to 'autofocus': 114 years of camera evolution). Kamera Rebyū: Kurashikku Kamera Senka (カメラレビュー クラシックカメラ専科) / Camera Review: All about Historical Cameras no.10, September 1987. No ISBN number. Konishiroku kamera no rekishi (小西六カメラの歴史, special issue on Konishiroku). Pp.8–13. Shibano Daisuke (柴野大輔). "Konishiroku seishiki tenmei-shamei no hensen ichiran-hyō" (小西六正式店名・社名の変遷一覧表, Evolution of the Konishiroku official company name). Kamera Rebyū: Kurashikku Kamera Senka (カメラレビュー クラシックカメラ専科) / Camera Review: All about Historical Cameras no.10, September 1987. No ISBN number. Konishiroku kamera no rekishi (小西六カメラの歴史, special issue on Konishiroku). Pp.90–1. Urs Brunner's Konica Collector website, includes online insturction manuals, advertisements, images of many models and more. Hexanon & Hexar User Group on Flickr is intended to show off the capabilities of Konica lenses and cameras of all vintages and types. Company profile of Konica Minolta Electronics Co., Ltd. and company profile of Konica Minolta Opto Products Co., Ltd. This page was last edited on 14 March 2019, at 09:46.